Road Runner Girl: Gulf Coast Half Marathon on the Louisiana Northshore! 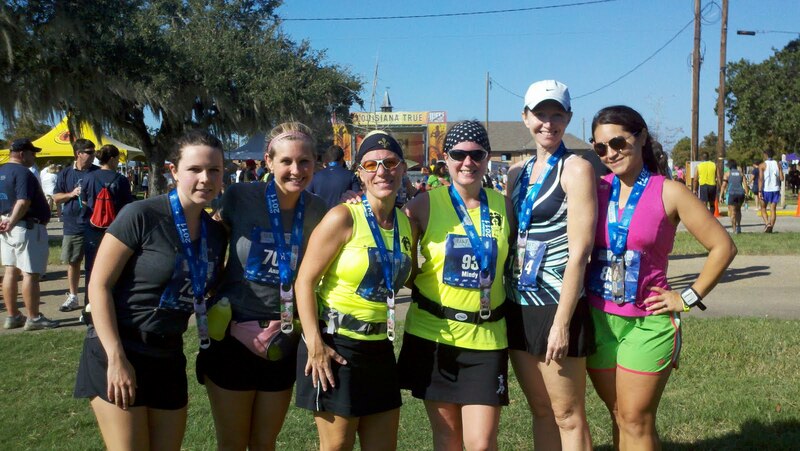 Gulf Coast Half Marathon on the Louisiana Northshore! Whew!! What a weekend!! I woke up EARLY Friday morning (the day I was supposed to leave) with a stomach bug. I'm talking diarreah, chills, and sweating profusely. I was face down on the bathroom floor for a few hours before I could make it back to my bed. Miserable! Around 4:30 AM I was able to go back to sleep. When I woke up around 7 I felt ok but really really weak. I called my friend Paige (who I was supposed to leave for New Orleans with at 2:00 that afternoon) and told her what was going on. 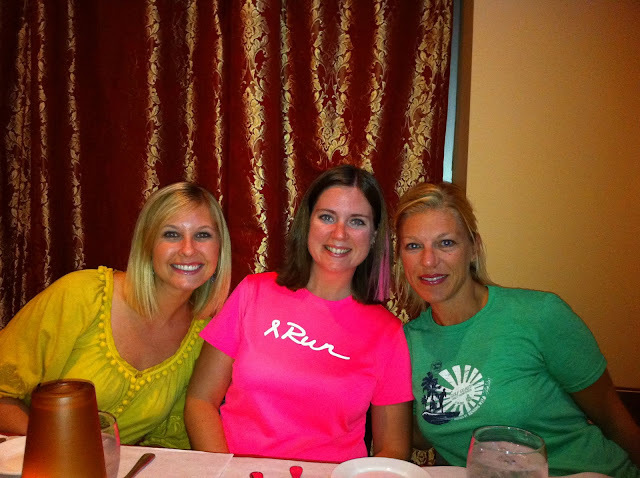 She and 2 of our other running friends had had the stomach bug the week before so I knew I had caught it from them. From their experience, I knew I would probably be feeling better that afternoon so I decided to go ahead and leave with her. I ate a light breakfast and some chicken noodle soup for lunch and those stayed down so I thought I was ok to travel. I started feeling a lot more stronger in the car. By the time we reached New Orleans and Paige's mom's house I felt fine...just really hungry. Paige's mom had cooked us a delicious meal of ribs, cauliflower, potato salad, baked beans, and garlic bread which I ate heartily. But...that was a mistake. Not long after eating my tummy felt a little uneasy but I thought it was going to be ok. So Paige and I decided to head into New Orleans for some fun! We got dressed, took pictures, and headed out the door. 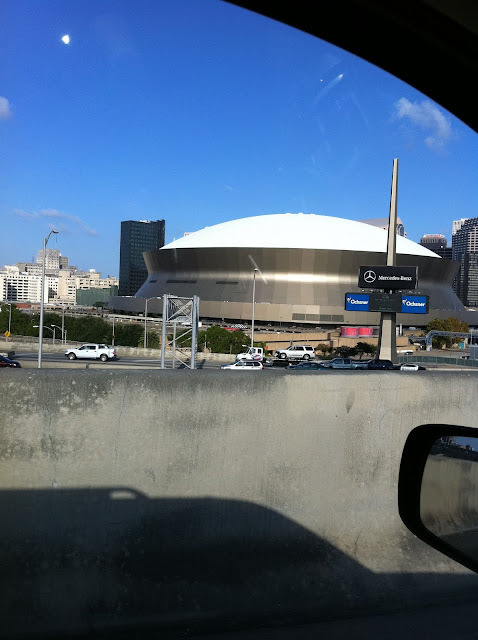 Well, after about a 45 minute drive (her mom lives west of New Orleans in Luling, LA) we made it to New Orleans. We were driving around looking for a place to park and my tummy made a loud gurgling noise. I knew that was trouble. So we turned back around to head home. Yep...we never even got out of the car!!! After turning down the wrong street (can you say ghetto) we finally made it back to the interstate and Paige's mom's house. And yes...it is so not fun to be in a strange house and have an upset tummy! I went twice before I went to bed. Good news is that I slept all night and didn't wake up until 9AM!!! I guess I needed that sleep!!! I woke up feeling a little weak but nothing compared to the day before. 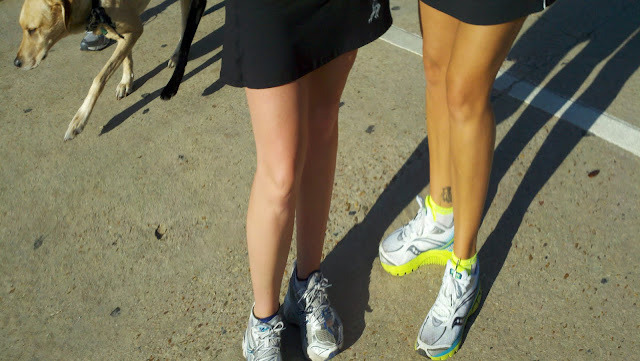 I ate a plain biscuit for breakfast and then Paige and I headed out to Mandeville to meet up with our other friends who were running the half with us. We stopped for lunch at Subway (because we thought it would be easy on my tummy). That was hard because when you are in New Orleans you want to eat the yummy food!!! But I didn't want to chance it since I had a half to run the next morning. 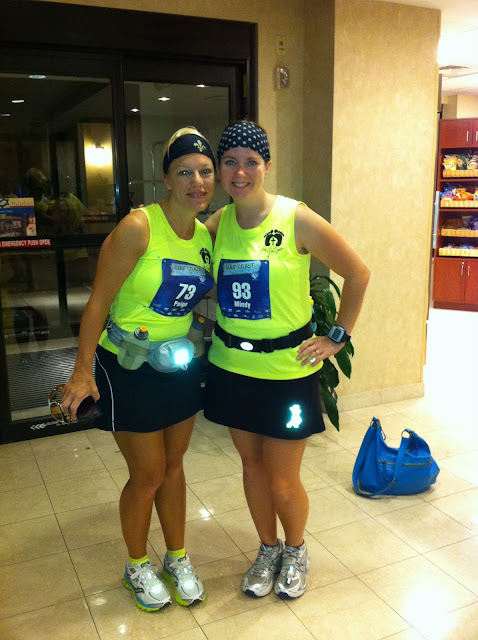 After lunch we made it to the hotel, met up with the other girls, and were on our way to packet pick up. My tummy felt fine the whole day and I felt normal. We picked up our packets at Varsity Sports...this cute little store in Mandeville. 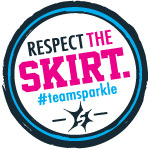 They had tons of deals going on and I bought a new runningskirt for 20% off! After packet pick up, all the girls were hungry (our dinner reservations weren't until 6:30 and it was only 3:00) so we found a restaurant right down the road from Varsity Sports called "The Rusty Pelican." We decided to go in and munch on some appetizers. We get in there and the whole menu is all fried food! Probably not the best idea for someone who had the stomach bug less than 24 hours ago. But with some heavy praying going on in the back of my mind, I enjoyed some fried mushrooms and fried pickles with everyone else. Yummy! After our appetizers, some of us headed in different directions until dinner. Paige and I went to her boss's house which was just down the street from our hotel. 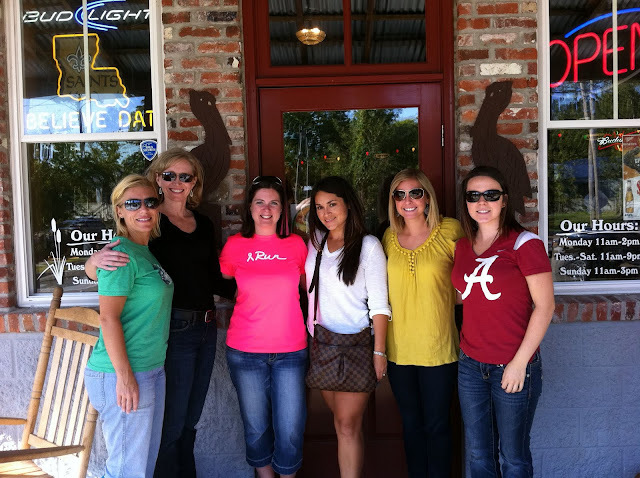 I enjoyed meeting her boss and his family...and LOVED hearing their Louisiana accents!!! Finally, dinner time was upon us...and my tummy did GREAT with those fried appetizers from the afternoon and was actually growling for the first time since I'd been sick. So I took that as a good sign. We had reservations at a little restaurant called Bosco's Italian. 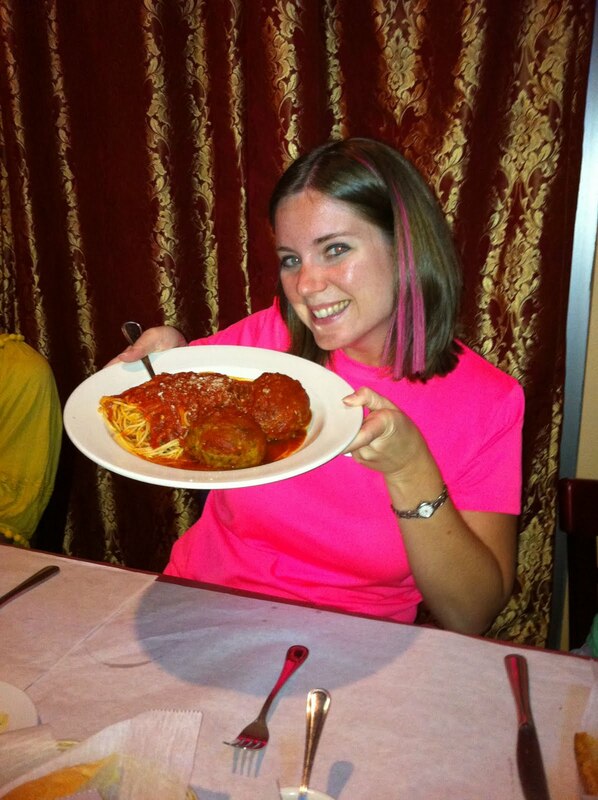 I ordered spaghetti and meatballs...and the meatballs were the biggest I had ever seen!!! 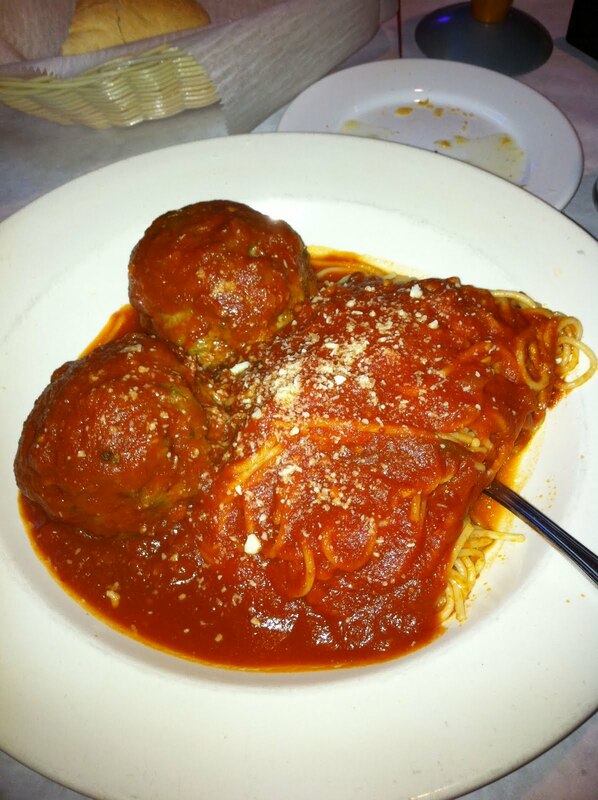 Sooo yummy but I could only eat half of a meatball! All of us at our table...Paige, me, and Ann on the left and Angela, Gina, and Amanda on the right! Ann, me, and Paige...hungry! Lol! 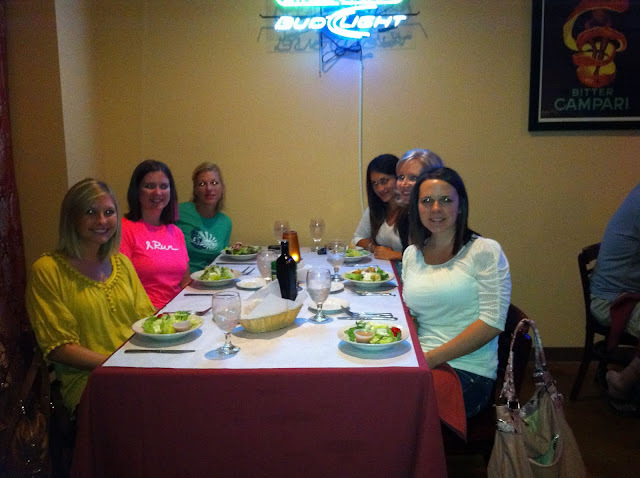 Bosco's was delicious and we had wonderful service! After dinner, we headed back to the hotel with promises to see each other in the lobby at 6AM. The starting line wasn't too far away and we assumed we would be there at 6:15...race was at 7. Here's my gear ready for the race! 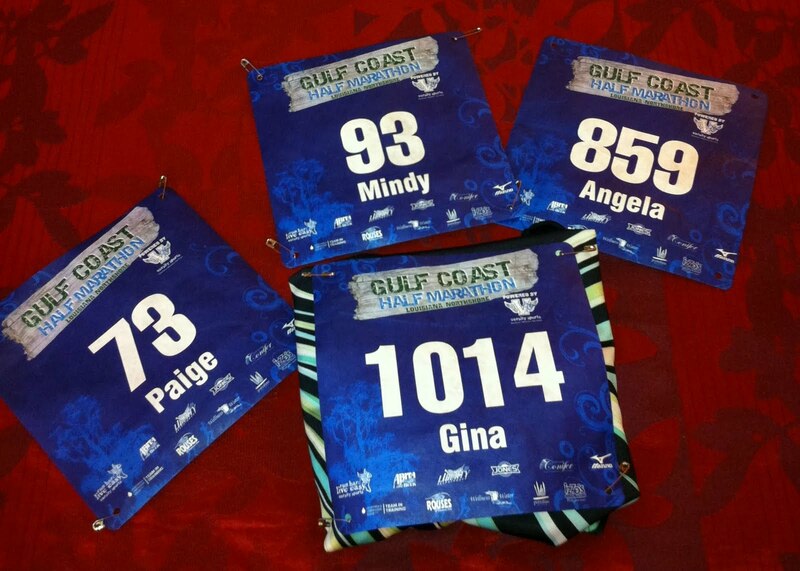 And my roomies and my race bibs! Just in case you were wondering, my stomach was still feeling great..even after dinner. We all were in our beds at 9:15...lights out around 9:30. And...I couldn't sleep! I couldn't breathe (remember my cold from earlier in the week). I got up twice to go potty and blow my nose. Finally, I dozed off...probably about an hour after going to bed. 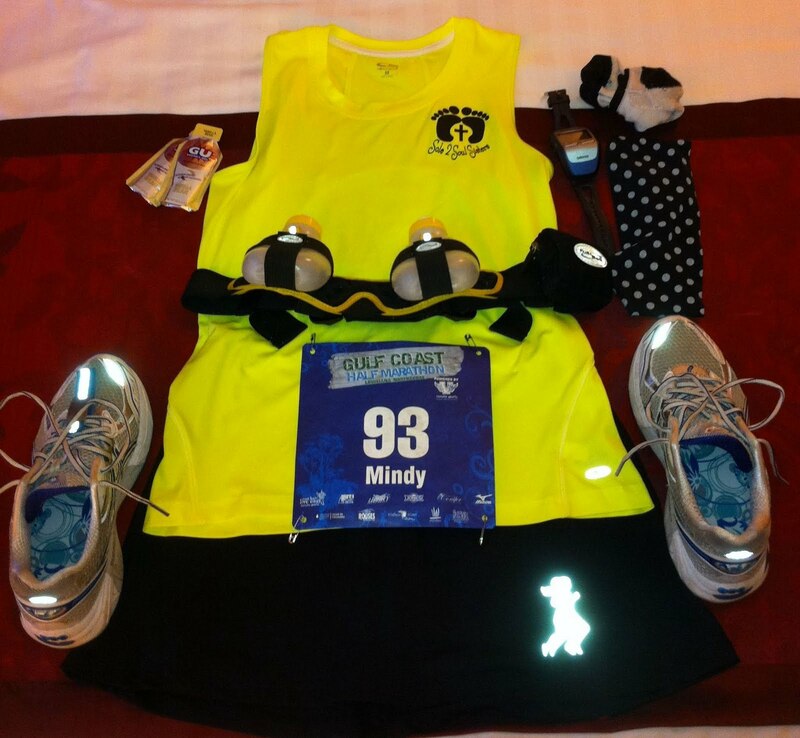 But I slept great and woke up refreshed and feeling ready to run 13.1!!! We met everyone down in the lobby but didn't have time to take many pictures. Paige and I did snap this one real quick. We HAD to get our picture together that we take before every race! We get into the car (thinking we knew where we were going) and we end up taking the wrong direction on the interstate! We have to call our hotel and get directions. We get headed in the right direction and are almost there when we get stuck in traffic!!!! All the other racers are trying to make it into the park where the start line is. We are all stressed out in the car because race time is at 7:00 and the clock is inching closer and closer to that time and we know we will still have to walk a ways to get to the start line. We finally made it inside the park gates and parked as soon as we could. I think by this time the clock says 6:57. We ran/walked to the start line. But Paige and Angela had to go potty before they could start running. I hate being late but I wasn't going to leave Paige...she is my running partner and I did NOT want to do this race without her! So I'm standing outside the porta potties (Paige and Angela are inside one) when the guns goes off to start! Finally Paige comes out and off we go! We weren't the very last ones to cross the start line but we were close! Good thing is we avoided all that start line congestion! So the first mile we had to basically catch our breath and calm our heart rates. I knew if we didn't calm down I wasn't going to make it for 13.1 miles! About mile 2 we started having fun! 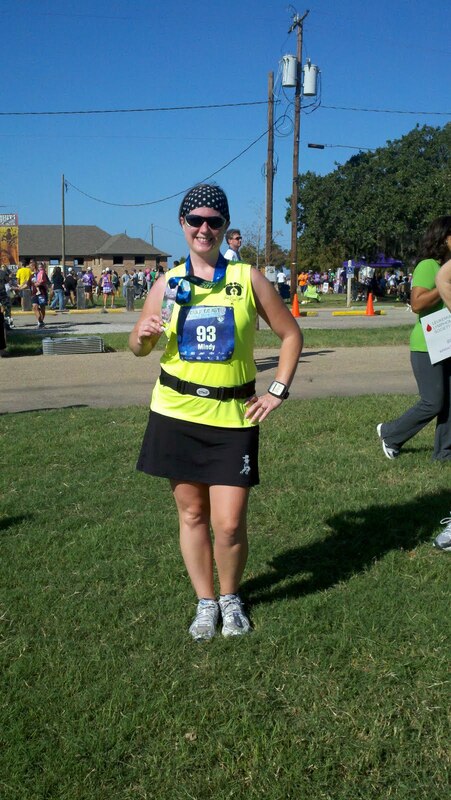 My goal was to run this race at a pace between 11:30-12 minutes per mile. Slow but steady! The route was gorgeous and all of the workers and fans were so nice and cheered us on! It was really cool having your name on your bib because random people would just call out things like, "You're doing great Mindy!" Running by the lake was so pretty! And we ran in neighborhoods and saw some really beautiful homes. I was feeling great the entire run! Usually around mile 10 in a race, I hit my wall and have to start run/walk intervals. My goal for this race was to run the ENTIRE time (except for water stops and pee breaks for Paige lol). At mile 12 I was ready to be done but determined not to stop to walk. And I made it!!!! I crossed the finish line with a time of 2:35:23!!! That's an average pace of 11:49...which I am completely satisfied with! It's not my best time...but I didn't walk at ALL! And that was my goal! And just to add...my Garmin said I ran 13.29 miles! Lol! Sporting my medal after the race! All of us with our medals at the race after party! And this picture is just too funny! We asked a girl to take a picture of us when we were running by the lake...and this is what she took lol! Now you know why I have a "take two" rule lol!!! And one last photo in the lobby of our hotel! It was a fabulous weekend (once I got over the tummy troubles) and a fabulous race that I definitely want to do again next year!!! I can't take too much time off to recover...Savannah is in 4 weeks!!! I love your race report! And so glad you got over your tummy issues BEFORE the race!!! It really could have been a bad deal. Congratulations on reaching your goal and good luck in Savannah. I do race reports on my blog as well; it is: 222.run4it-headricks.blogspot.com if you would like to read them. I run a lot in the Gulf Shores area and you might be interested. Last LONG Run Before Savannah!!! 3 Miles Around the Mall! 10 Miles Down by the Bay!